At Roofline, we honestly believe that we are the industry leaders. The company evolved from humble beginnings. With a trade background of over 20 years there isn’t a lot about roofing our team doesn’t know or understand. Our roots were grounded early when Aaron, the company’s owner, worked as a tradesman. For decades he fine tuned his skills and knowledge of the trade. A master craftsmen and tradesman, he intimately knows every skill associated within the roofing trade. You are dealing with a qualified roof tiler who’s speciality is restoration. We are honest and reliable, priding ourselves and the company’s integrity with every job we undertake. With a focus on complete satisfaction, the team works together to ensure a professional finish every time. Aaron began working as a roofing contractor in the early 90’s. Even then, his skills were appreciated by several of the leading restoration companies. For a period of well over 10 years he gained valuable experience and a reputation as being a one of the industries leading tradesman. These were the solid foundations laid for Roofline. Don’t be rushed, pressured or pushed into making a decision on your roof. Obtain a few quotes, compare the products and the actual work being carried out – they can differ greatly. The old saying goes “compare apples with apples”. This is paramount in the roofing industry. Do not be fooled by an excessively cheap quote. The chances are you will pay in the long run, or the short run for that matter, which is often the case. Shop around and I encourage you to make an informed decison. That way I am sure you will consider Roofline. 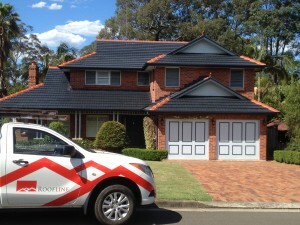 Look no further than Sydney’s Roofline for all your roofing needs. It was great to finally have our roof cleaned and painted. Aaron and his team did a wonderful job with the roof restoration. I would highly recommend these guys if you are in Sydney and looking for great service at a great price. 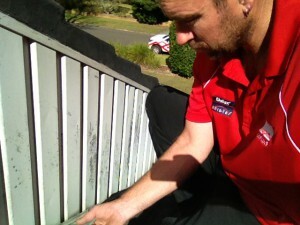 Thanks again Roofline. We have just had a full roof restoration done by Aaron and his team from Roofline. We were most impressed with their professionalism, promptness and attention to detail that produced an outstanding result. They were neat, tidy, cleaned up any mess that they made and most importantly easy to communicate with. We would recommend Roofline to anyone who needs work done to their roof. My house has a new roof! Painted the roof, fixed pointing and gullies, solved leaks that have been around for years. Top job.